Everything runs smoothly until I want to play some DVD movies on it for my kids. If you also have an InnoTab, you will know that it do not support play DVD movies directly. The only way to solve the problem is convert DVD movies to the friendly format with InnoTab. Although my husband always converts our DVD collections to play on iPad with Pavtube DVDAID, I am not sure if it is suitable for Kids Tab. Just have try, I surprised found that it succeed! Now, I will show you how to play DVD movies on Vtech InnoTab 3 (it also suitable for InnoTab 2). 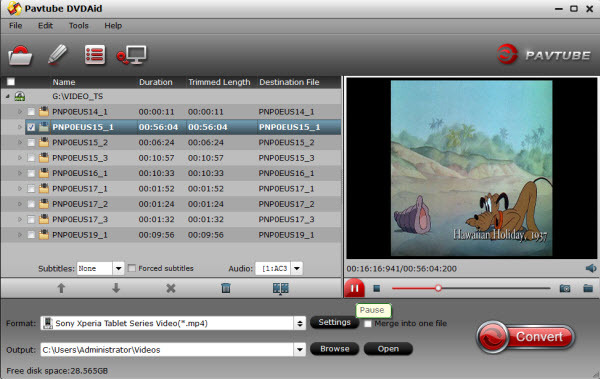 Step 1: Download the trial version of Pavtube DVDAID or buy it now to enjoy New Year Promotion. Step 2: After you insert the DVDAID, launch it and load DVD movies with “Load file” icon. It also supports IFO image files. Below is the screenshot of the main interface after I load DVD movie. Step 4: Customize the profile settings. You can adjust the video bitrate, frame rate, audio channels, etc. According to video testing result, for watching videos on the Android tablet, 720p with 1500~2500kbps is just all right. If your children begins to learn words, you could add some subtitles for the output videos so that they can review the words when enjoying the movies. Step 5: Click the “Convert” button to start the conversion. Just waiting for a while and then you will get the output videos. Step 6: Connect the Inno Tab to the computer with the USB cable, and then turn it on. Double click on your computer icon and then double-click on the drive letter for your Inno Tab. Double click on the “LLN” directly, then “MOVE”. Copy your video into the directory. Note: Do not use the LLN program! Just copy it directly to the SD card. Unplug the USB cable and start your video program and the movies should be there ready to play. Hope this can help you as well.